Distinguished Ensemble Residency work includes Catholic University Washington D.C., Harvard University, Florida State University, Cortona Music Festival (Italy), Music ’98 at Cincinnati Conservatory of Music, University of California Berkeley, Hochschule für Musik Würzburg, UludağConservatory in Bursa and Pera Sanat Günleri in Istanbul (Turkey), Facultad de Artes de la Universidad de Chile, and Landesmusikakademie Hessia and Goethe-Institute (Germany). Often residency work involves readings of student works as with the Birmingham Art and Music Alliance, Cincinnati Conservatory of Music, University of Flordia Gainsville, University of Arizona, Student Composers Inc. and American Composers Forum. In 2013, Duo46 conducted their first of several interactive Skype readings of new works by composition students at the Hartt School of Music via the E-Dome at Cambrian College. Recordings available on Albany Records (Aires de Sefarad, Psuedosynthesis), Centaur Records (The Guitar Music of Karl Korte, High Wire Acts), Ablaze Records (Whirl), Guitar Plus Records (Homage to the ‘50s), Kyra Records (Artist Around The World Perform Stephen Funk Pearson), Meyer-Media (Fables, Forms and Fears), NEOS (Music of Marcela Pavia and Max Keller), Beauport Classical (Fleeting Visions: Collaboration II), Revello (Winter and Construction), and Summit Records (Untaming the Fury, Communing with Music). Reviews available from American Record Guide, Fanfare, Classical Guitar Magazine, Gramophone, Guitar Review, Soundboard, The Strad, among others including web-based and newsprint reviews. More details available at http://www.duo46.com. Duo46 now reside in Ontario, Canada with daughter Sophia and son Max. Violinist Beth Ilana Schneider-Gould (B.M. Indiana University Bloomington, M.M. University of Arizona) has been described as "a prodigious talent, poised and introspective, and very impressive" by the Los Angeles Times. She made her soloist debut at the age of 16 with the Cincinnati Symphony Orchestra. She has performed throughout the United States including the Kennedy Center and Carnegie Hall, and has toured Europe with Sir George Solti and the Schleswig Holstein Festival Orchestra. She has performed chamber music with many renowned artists including Lynn Harrell and Yefim Bronfman, has worked under conductors such as David Zinman, Neeme Jarvi, Simon Rattle, Kurt Masur, Leonard Slatkin and Christoph Dohnanyi, and has performed in concert at the Los Angeles Philharmonic Institute, the Sarasota Chamber Music Festival, the Meadowmount School of Music, and ENCORE. Her primary teachers have included Linda Cerone and Victor Danchenko at the Cleveland Institute of Music, Eugene Gratovich at University of Texas Austin, Conny Kiradjieff of Cincinnati Symphony, Andreas Reiner of the Rosamunde String Quartet, Mark Rush at the University of Arizona, and Nelli Shkolnikova at Indiana University. Chamber Music coaches have included Henry Meyer from the Lasalle Quartet, Paul Katz from the Cleveland Quartet and Phillip Setzer from the Emerson Quartet. Former Assistant Professor at Eastern Mediterranean University on the island of Cyprus, Beth is currently teaching violin at Cambrian College and the Cambrian College Music Academy in Sudbury. Guitarist Matthew Gould (B.Mus. Peabody Institute of the Johns Hopkins University with Manuel Barrueco; M.Mus. University of Arizona with Tom Patterson; D.M.A. Arizona State University with Frank Koonce) has been described by his mentor, Manuel Barrueco, as "a guitarist capable of giving performances of great beauty, enthusiasm and control". He is active as a performer, scholar and teacher. As a scholar, Dr. Gould has presented papers on “Composing for Guitar” at San Francisco Conservatory, UC Berkeley, CSU Fresno, and the Vittadini School of Music (Italy), including a theoretical analysis in “Ex Tempore. A Journal of Compositional and Theoretical Research in Music” of Toward the "SEA" for Alto Flute and Guitar by Toru Takemitsu. Current projects include the development of the Sudbury Guitar Trio, having recently toured Italy and Netherlands, and acting as Artistic Director of Guitars Alive in Sudbury. As an American football fanatic and Baltimore Ravens fan, Matthew served as Head Coach of the champion Crows American Football Team, part of the Turkish American Football League, while an Assistant Professor of Music at Eastern Mediterranean University on the island of Cyprus. Former teaching posts include Arizona State University, University of Memphis, Paradise Valley College, Peabody Conservatory of Music Preparatory, and is currently Director of Guitar Studies at Cambrian College in Sudbury, Ontario. 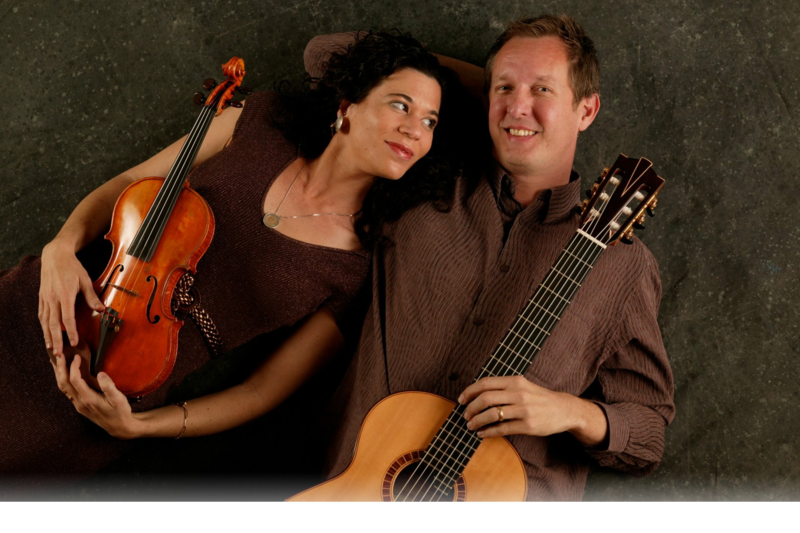 Duo46, ensemble qui effectue des tournées internationales, est formé du guitariste Matthew Gould et de la violoniste Beth Ilana Schneider-Gould. En tant qu’artistes vivant au 21e siècle, Beth et Matt ont adopté la musique de compositeurs contemporains, et leurs prestations et enregistrements célèbrent la nouvelle musique de chambre pour guitare souvent composée spécialement à leur intention. Ce répertoire inclut des doubles concertos avec orchestre, de la musique électroacoustique et des trios avec mandoline (B.A.M. avec l’artiste de Deutsche Grammophon Avi Avital, d’Israël, déjà en nomination aux prix Grammy), clarinette, (Jana Starling, Ph.D., Western University, Canada), violoncelle (Erich Oskar Huetter, Austriche) et piano (The Strung Out Trio avec Nathanael May, Ph.D., É.-U.) Le duo a commandé à ce jour plus de 100 œuvres nouvelles, et un choix de partitions est disponible chez Les Productions D’Oz (Canada) et Sconfinarte (Italie). Parmi les prix et distinctions remportés par Duo46 figurent deux bourses de commande du Barlow Endowment for Music Composition de la Brigham Young University (Michael Quell, Allemagne et Geoffrey Gordon, É.-U. ), une bourse de commande de la chaîne CBC Radio 2 (John Oliver, Canada), une ENCORE Performance Grant de l’American Composers Forum (John Mayrose, É.-U. ), a Feline Shouse Fellowship au Great Lakes Chamber Music Festival, une sélection comme Showcase Ensemble pour Chamber Music America, le parrainage d’une tournée par l’ambassade américaine au Chili et des radiodiffusions sur les ondes de Bayrak, de l’Union européenne de radio-télévision, de la National Public Radio, de la British Broadcasting Corporation, de la New Zealand Radio et du KPFK North Hollywood Global Village, entre autres. 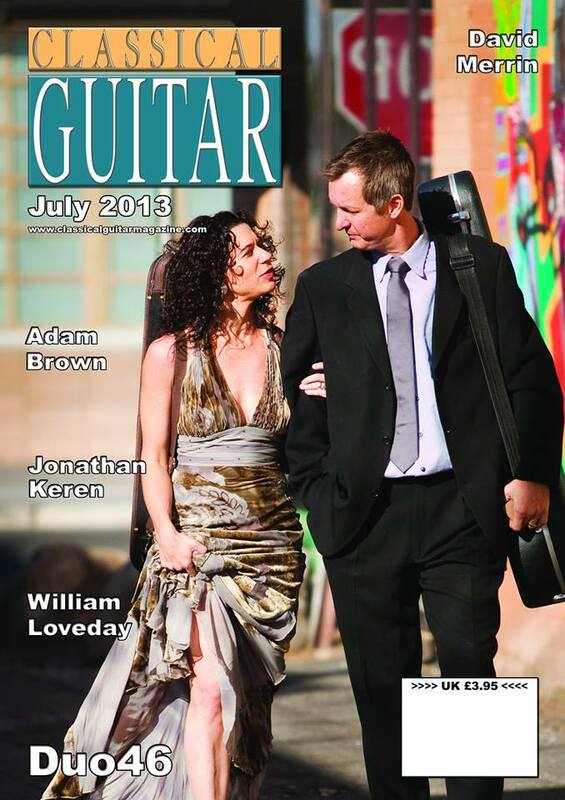 Tout récemment, Duo46 a fait la couverture du Classical Guitar Magazine (Royaume-Uni) avec une entrevue sur la situation actuelle de la guitare dans la musique de chambre. Duo46 s’est produit surtout en Autriche, au Canada, au Chili, à Chypre, en Angleterre, en Allemagne, en Grèce, en Italie, aux Pays-Bas et en Turquie, et il a fait des apparitions remarquées au Kennedy Center (Washington, D.C.), au Guitar Foundation of America International Festival (Oberlin, San Francisco, Georgia, Los Angeles), au New York Guitar Seminar à Mannes (É.-U. ), au Festival international de guitare (Chili), au X-Fest Experimental Arts Festival (É.-U. ), au California State University Fresno New Music Festival (É.-U. ), au Festival international de guitare d’Hermopoulis (Grèce), aux Concerts du printemps internationaux et au Festival international de musique de Bellapais (République turque de Chypre du Nord), au Steirisches Kammermusik Festival (Austriche) et au festival de musique soundSCAPE (Italie). La saison 2014 marquera le 20e anniversaire de Duo46. Les stages de résidence de distinction incluent la Catholic University à Washington, D.C., la Harvard University, la Florida State University, le Festival de musique de Cortona (Italie), Music ’98 au Cincinnati Conservatory of Music, la University of California à Berkeley, la Hochschule für Musik de Würzburg, le Conservatoire de Uludağà Bursa et Pera Sanat Günleri à Istanbul (Turquie), la Facultad de Artes de la Universidad de Chile ainsi que la Landesmusikakademie Hessia et le Goethe-Institute (Allemagne). Le travail de résidence comporte souvent la lecture d’œuvres d’étudiants, comme à la Birmingham Art and Music Alliance, au Cincinnati Conservatory of Music, à la University of Florida à Gainsville, à la University of Arizona, à Student Composers Inc. et à l’American Composers Forum. En 2013, Duo46 a réalisé la première sur Skype de plusieurs lectures interactives d’œuvres nouvelles d’étudiants en composition à la Hartt School of Music par le biais de l’E-Dome du Cambrian College. Enregistrements disponibles sous les étiquettes Albany Records (Aires de Sefarad, Psuedosynthesis), Centaur Records (The Guitar Music of Karl Korte, High Wire Acts), Ablaze Records (Whirl), Guitar Plus Records (Homage to the ‘50s), Kyra Records (Artist Around The World Perform Stephen Funk Pearson), Meyer-Media (Fables, Forms and Fears), NEOS (Music of Marcela Pavia and Max Keller), Beauport Classical (Fleeting Visions: Collaboration II), Revello (Winter and Construction) et Summit Records (Untaming the Fury, Communing with Music). Critiques parues dans American Record Guide, Fanfare, Classical Guitar Magazine, Gramophone, Guitar Review, Soundboard et The Strad, entre autres, y compris des critiques sur le web et dans les journaux. Pour plus de détails visitez http://www.duo46.com. Les membres de Duo46 vivent actuellement en Ontario, au Canada, avec leur fille Sophia et leur fils Max. La violiniste Beth Ilana Schneider-Gould (B.M. Indiana University Bloomington, M.M. University of Arizona) a été décrite comme étant « un talent prodigieux, posée et introspective » par le Los Angeles Times. Elle a fait ses débuts en solo à 16 ans avec le Cincinnati Symphony Orchestra. Elle s’est produite à travers les États-Unis, y compris au Kennedy Center et au Carnegie Hall, et elle a fait des tournées en Europe en compagnie de Sir George Solti et du Schleswig Holstein Festival Orchestra. Elle a joué de la musique de chambre avec de nombreux artistes de renom, notamment avec Lynn Harrell et Yefim Bronfman, elle a travaillé sous la direction de chefs d’orchestre tels que David Zinman, Neeme Jarvi, Simon Rattle, Kurt Masur, Leonard Slatkin et Christoph Dohnanyi, et elle a donné des concerts au Los Angeles Philharmonic Institute, au Sarasota Chamber Music Festival, à la Meadowmount School of Music et à ENCORE. Parmi ses principaux professeurs figurent Linda Cerone et Victor Danchenko au Cleveland Institute of Music, Eugene Gratovich à la University of Texas à Austin, Conny Kiradjieff de Cincinnati Symphony, Andreas Reiner du Rosamunde String Quartet, Mark Rush à la University of Arizona et Nelli Shkolnikova à l’Indiana University. Ses répétiteurs de musique de chambre incluent notamment Henry Meyer du Lasalle Quartet, Paul Katz du Cleveland Quartet et Phillip Setzer de l’Emerson Quartet. Anciennement professeure adjointe à l’Université de la Méditerranée orientale dans l’île de Chypre, Beth enseigne actuellement le violon au Cambrian College et à la Cambrian College Music Academy de Sudbury. Duo46 ytours internationally with appearances in Austria, Belgium, Canada, Cyprus, England, Germany, Greece, Italy, Netherlands, and Turkey. 6 Commissions (Asia, Carollo, Liderman, Lidov, Schwendinger, Korte), Steirisches Kammermusik Festival (Austria), 4 Visiting Composer Series (Cyprus), Ensemble Residencies: U. of Minnesota Deluth New Music Fest, Barlow Endowment for Music Composition at Brigham Young University with Geoffrey Gordon. CD High Wire Acts ( Centaur Records), Skype reading w/Hartt School of Music, Commissions by Robert Lemay and Chris Williams, College Music Society Conference, SBSQ and Guitar, son Max Carmelo Gould born.